KALX DJ Cuppa Joe has been a big supporter of ours since the early days. And we happen to think his show is amazing... Which is why we're honored to have made it onto Cuppa Joe's Best Albums of 2017 list, and truly touched that his favorite song of 2017 is Shotgun Superman off our new album. There were an insane number of great songs released last year, and to land his favorite... wow. Thanks Cuppa Joe. We love ya. Wow, Sometimes a Great Ocean made it onto another very fine "top albums of 2017" list. This time, it's Paul Liberatore's "Marin musicians’ best albums of 2017." We're honored to sit alongside the awesome Steve Kimock, our town-mate Matt Jaffe, and other great ones! Check out the top albums here. We're honored that the venerable Steve Ferra chose Sometimes a Great Ocean for the #33 spot on Absolute Powerpop's annual top albums list. 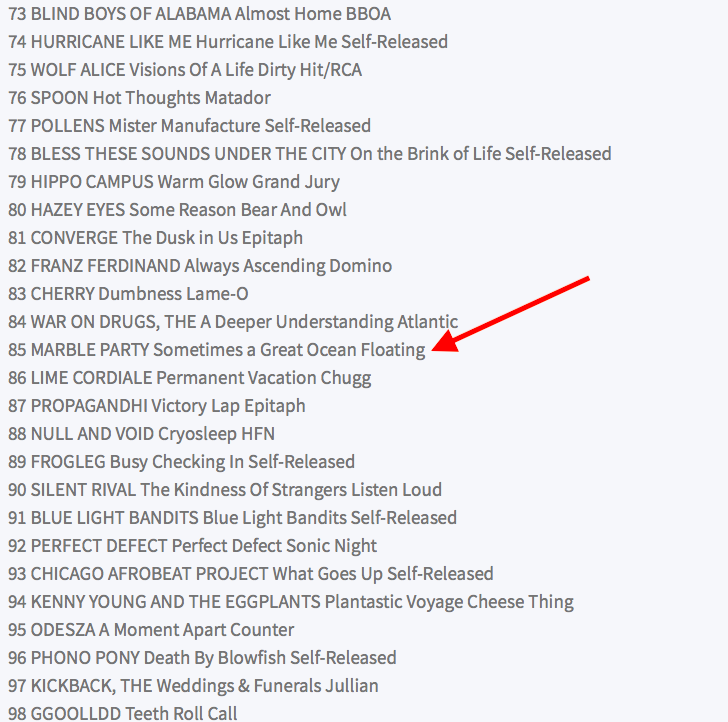 We're among some very fine powerpop company! On Marble Party’s third album, “Sometimes a Great Ocean,” the Mill Valley indie rock quartet continues its winning streak with 10 new songs marked by the same kind of quirky lyrics and inspired musicianship that made its first two albums such a pleasure. From the Cars-like driving rhythms of “Brooklyn Battles Winter” and the George Harrison-esque sitar sounds and Beach Boys harmonies of “60 Cycles” to the rock drums and fuzz bass of “S.A.M.” and the Steely Dan-like sophistication of the ballad “Shotgun Superman,” Marble Party artfully blends power pop melodies with recognizable classic rock influences into a package that sounds fresh rather than merely nostalgic. On the whimsical, jazzy “Coaster,” the band — Dan Barbee, keys and vocals; Eric Eisenberg, guitar and vocals, Greg Merriman, bass and vocals and drummer Andy Trapp — bring in Ben Kline on trombone and Jim Pettigrew on flugelhorn to give the song the horn band punch of a modern-day Blood, Sweat and Tears. Lyrically, they cleverly borrow the title phrase from Harry Nillson’s “Everybody’s Talkin’” that will cause listeners to stop and think where they’ve heard that line before. Recorded at Panoramic House in Stinson Beach and Birdland Studios in Mill Valley, “Sometimes a Great Ocean” is a brilliantly arranged and masterfully conceived studio album that may be even more polished than the band’s first two records, the debut “Lyle” in 2012 and 2014’s “Plush Up.” All are on Sausalito’s Floating Records. Local music fans can only hope there are more to come. Tickets are now on sale for our “Sometimes a Great Ocean" album release party at Sweetwater. We're really excited about the new album and can't wait to give you a copy. We'll have special musical guests, spanky new Marble Party t-shirts, hats and stickers, and a great night of music in store.